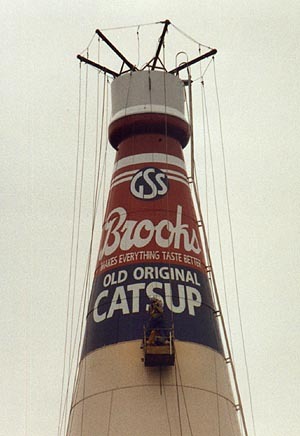 The Restoration of the World's Largest Catsup Bottle! 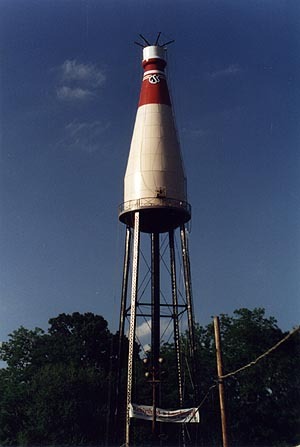 Thousands of volunteer hours were spent over two years time raising the $80,000 needed to repair, strip, and paint the aging water tower in Collinsville, Illinois. The hard work paid off in June of 1995 when the monumental job was complete. Thanks to a nationwide "Paint It!" 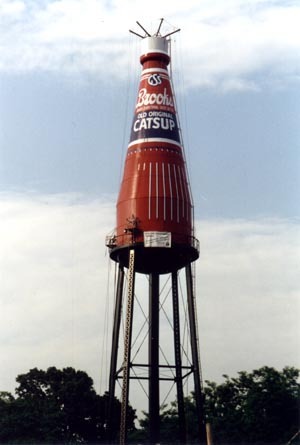 campaign, the World's Largest Catsup Bottle was restored to its original design and glory. 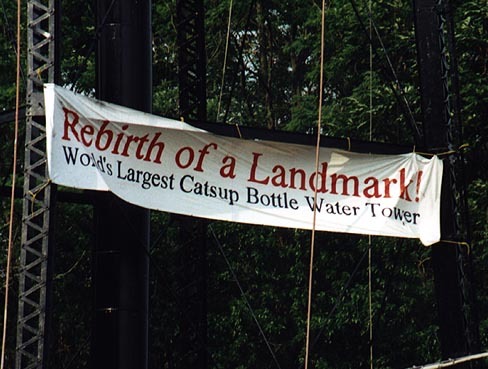 "We sold over 6,000 t-shirts and sweatshirts all across the country," said Judy DeMoisy who lead the 14-member Catsup Bottle Preservation Group. "And it was the outpouring of donations, large and small, that enabled us to reach our goal." 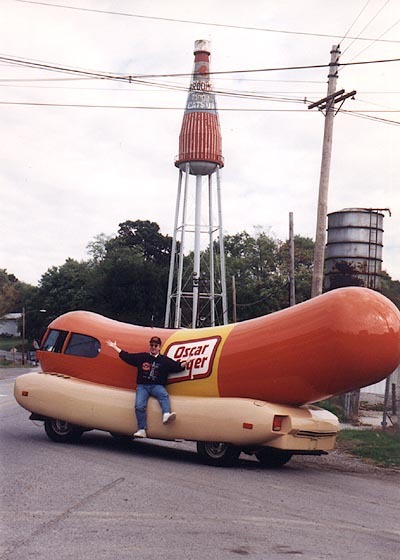 Auctions, bake sales, a radio station live broadcast - that included a visit from the Oscar Mayer Wienermobile) and lots of hustle went into the massive effort. 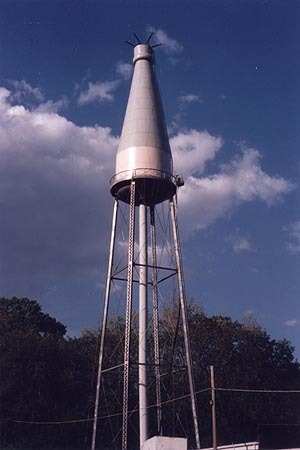 Enough money was raised to establish a maintenance fund, and to purchase a flood light to illuminate the Bottle at night. The first guesstimates for the project were around $28,000. But when the bids came in, the lowest bid was three times as much. That just made everybody work harder. Catsup Bottle shirts are now being worn in all 50 states, as well as London, Moscow, and Australia. The actual cost for the restoration was $77,440. It was handled by Diversified Coatings, Ltd. of O'Fallon, Illinois. Paint for the project was donated by the Tnemec Company of Kansas City, Missouri. 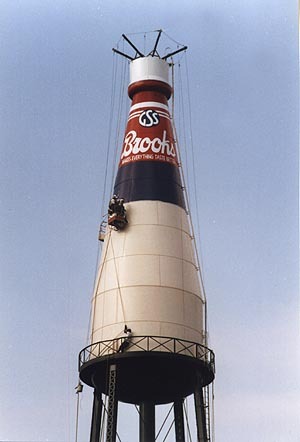 During the first week of April 1995, workers from Diversified Coating began the task of scraping and repairing the giant steel bottle. The paint being removed was lead-based. Extra care was taken during the stripping process to protect the environment. 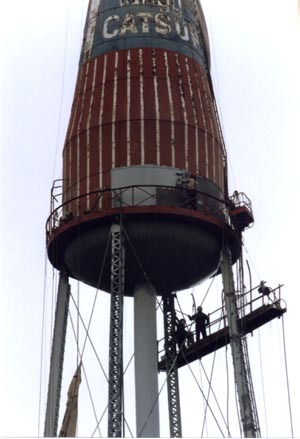 Workers had to maneuver their baskets aroound the water tank more than 100 feet in the air. Painters did the job by hand while suspended by cables. 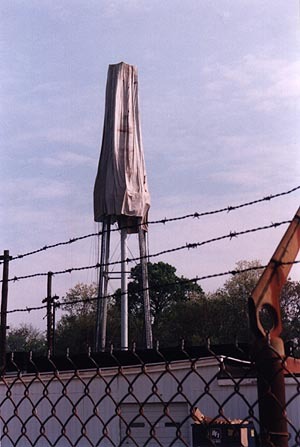 The Bottle's irregular shape would not accommodate scaffolding or bulk-painting equipment. 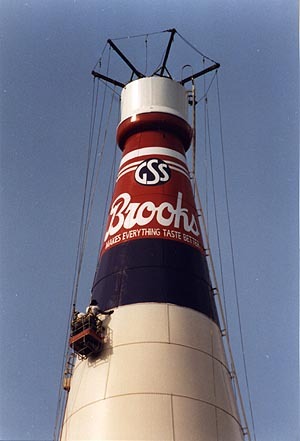 The tower once again bears the logo of the Gerhart S. Suppiger Company that owned the Brooks Catsup bottling plant and had the tower built in 1949. The slogan "Makes everything taste better" also returned. Continuous rainy weather slowed the project a bit, but by the first of June, the job was nearly complete. 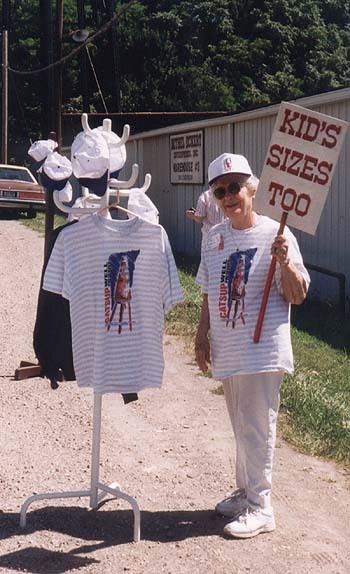 The community celebrated with a Main Street parade on June 3, 1995, and with a Bottle-lighting ceremony that evening. By late June of 1995 the restoration was finished. "I'll never get to thank the thousands of supporters," DeMoisy said. "The community, regional, and national participation has been great. Together we did it!" To some the tower is still just a landmark, but to others it now stands as a shiney red, white, and blue symbol of the American spirit of cooperation and perseverance. 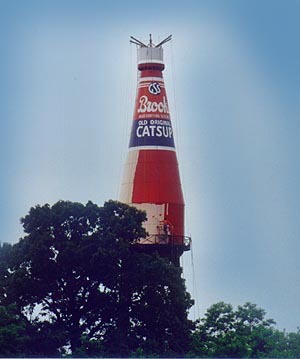 In August of 2002 the Brooks Catsup Bottle Water Tower was added to the National Register of Historic Places. Read more on our "History" page and for a more detailed look, check out the News and Information Archive.